During breakfast, Tibetan bread and tea taken in the Monlam Pavillion, Rumtek Head Khenpo, Kelsang Nyima, had reminded everyone of the Karmapa’s words: The number of people gathered together at the Monlam is not of great importance; what is essential is that those present have the correct motivation. Following the mandala offering to Gyaltsap Rinpoche, the words of A supplication to the Lineage of the Bodhisattva Vow rang out through the Monlam Pavillion. This prayer asks for the blessing of the lineage from which the mind training teachings come, emphasising that the basis of all mind training is the motivation of bodhicitta, the awakening mind, that we too may become ‘lamps of the world’ and lead others on the unmistaken path to enlightenment. 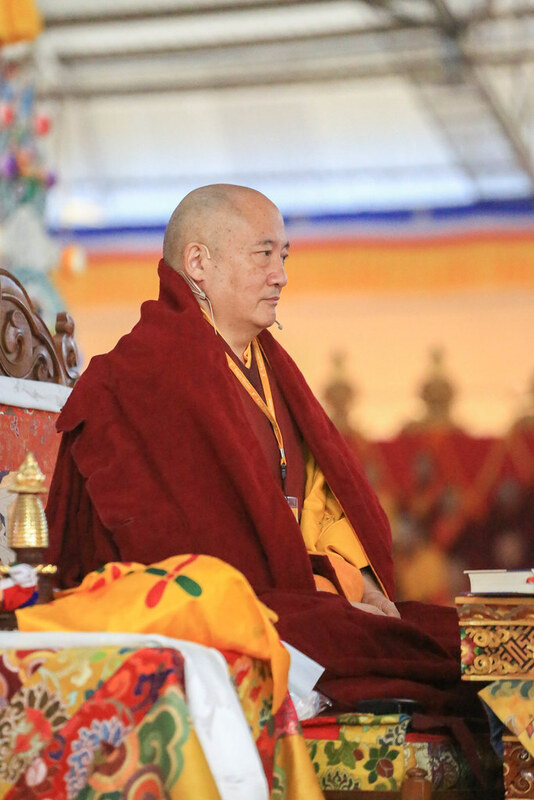 And so His Eminence Goshir Gyaltsap Rinpoche began the third session of his teachings on The Seven Points of Mind Training by asking everyone to establish the correct motivation for listening to the teachings and arouse the mind of bodhicitta. Rinpoche explained that during the mind-training session you engaged in tong-len [the practice of sending and taking], but, after meditation, as we engage in our everyday activities, we should consider everything to be like an illusion, as not truly existent in the way we think they are. Viewing everything, ourselves and others and the external world, as illusion cuts through attachment. Whereas the shravakas undermined attachment to the body by contemplating how unclean it was, in the Mahayana tradition, we consider the body to be an illusion, and that allows us to engage in working for the benefit of others. But having great attachment to the body counteracts being of benefit to others. Further, when we have to engage in activities we find difficult, if we can remember the illusory nature of phenomena, it can mitigate our hesitation or fearfulness. Similarly, when we experience good things, it is of benefit to remember that they also are illusory. Clinging to the idea that phenomena have some reality can impede the accumulation of virtue. If you can combine mind training with Vajrayana practice such as visualising yourself as a yidam deity, while you engage in prostrations, generosity or any of the other perfections, you can accumulate much vaster merit. In all activities, train with sayings. In the beginning it can be challenging to take on the suffering of others, so this is a skilfull method to build confidence by starting with ourselves. We imagine that we are taking on all our future suffering now so that in future lives we will be free of this suffering and experience greater joy and well being. Then we can extend this practice to others, expanding the sphere from family and close friends to our teachers and acquaintances, moving ever outward. 3. Transforming Difficulties into the Path of Enlightenment. Transform all misfortune into the path of enlightenment. The first part of this section is on training in relative bodhicitta. The root of all our suffering is our ego-clinging and self-cherishing. Since beginningless time this has caused trouble for us and for others. Other types of enemy only cause harm in one lifetime. For example, in Tibetan tradition there is a harmful spirit —Gyalgong— but even that spirit’s maleficence is limited to seven lifetimes. Also, it can only cause the suffering of different types of sickness and is powerless to cause other sufferings such as sending people to the hell-realms, whereas the enemy of self-clinging is pervasive through the six realms causing the suffering of the three lower realms, the suffering of humans, and the suffering of the demi-gods and gods. ka ha na ā li ta / ha ma sa sha ki yu"
Further, even though malicious spirits may create difficulties for us, as they are actually helping us on the path to enlightenment by giving us opportunities to collect the two accumulations, we should show our gratitude by being kind to them. So we should respond by doing things to benefit them such as offering torma, certain acts of generosity and aspiration prayers for their future well-being. Buddha's body emanates light, and this is the result of the patience he exercised earlier towards malevolent beings. Is the unsurpassable protection of emptiness. The advice here is that, when we encounter the ‘confused appearances’ of difficult situations, we should see them as manifestations of the four kayas or bodies of the Buddha, and in this way, suffering will be dispelled. We should reflect that their essence is emptiness, which pertains to the dharmakaya; the appearance, whether form or sound, is the aspect of the nirmanakaya ; the union of the clarity of the appearance and emptiness is the sambhogakaya, and the uniting factor is the svabhavikakaya. If we can hold this view of emptiness, it is like armour, it is a protection against suffering. The first is the accumulation of merit – prostrations, organising pujas, reading the sutras, offering tormas and so forth– but we should always bear in mind what will be of most benefit to all sentient beings. We should do so without hope or fear – unafraid to experience suffering. The second is the confession and purification of misdeeds. We should always consider difficult circumstances as a product of misdeeds we or others have committed in the past. So we should aim to purify these and also include the benefit of others. In order to purify them, we use the four powers: regret; the resolve not do them again; reliance on the support of the Three Jewels; and the power of the antidote – such as the mantras of Akhshobhya, Vajrasayttva or the six syllable mantra- but the most effective method is meditating on emptiness. Reading and reciting certain sutras such as the Prajnaparamita or the Sutra of Liberation is also helpful. The third is making offerings and showing gratitude to harmful spirits. We should make it clear that we are working for the benefit of all sentient beings. Finally, the fourth is offering tormas to the protectors, requesting the facilities to practice for the benefit of all sentient beings. We should always include other sentient beings in whatever we do or experience. In positive experiences, we should wish that all sentient beings can experience them. When we experience difficulties, we should wish for their freedom from difficulties. The first of these is strong determination: always keeping our bodhicitta aim at the forefront of our mind, thinking ‘until I attain the state of Buddhahood may I never be separated from bodhicitta, may I continuously engage in the conduct of the bodhisattva practice’. The second is habituation: whatever we are doing, we should maintain mindfulness, that we should never be separated form bodhicitta or from the mind-training practices. The third is the seeds of virtue: we should never feel complacent. Until we attain perfect Buddhahood, we must accumulate virtue, whether through mind training or the six perfections and so forth. We should never be satisfied. Nor should we only concentrate on great things; we have to focus on small things as well. The fourth is remorse because of our ego-clinging. We need to treat self-cherishing as an enemy because not only does it cause us suffering but it is also the greatest obstacle on the spiritual path. The fifth strength is aspiration: we need an aspiration for all of the virtue we have accumulated, such as, “May I myself be able to establish all sentient beings without exception in the state of Buddhahood. May I never be separated from the mind of bodhicitta. Whenever I encounter any difficult circumstances, may they arise as friends or aids in my practice towards Buddhahood. May they be an aid to my awakening like the great beings of the past have done. By this merit may all beings attain omniscience. From the ocean of samsara, may I free all beings!